Custom Toiletry Bag With David Beckham Fragrance & Why Consider It Too? 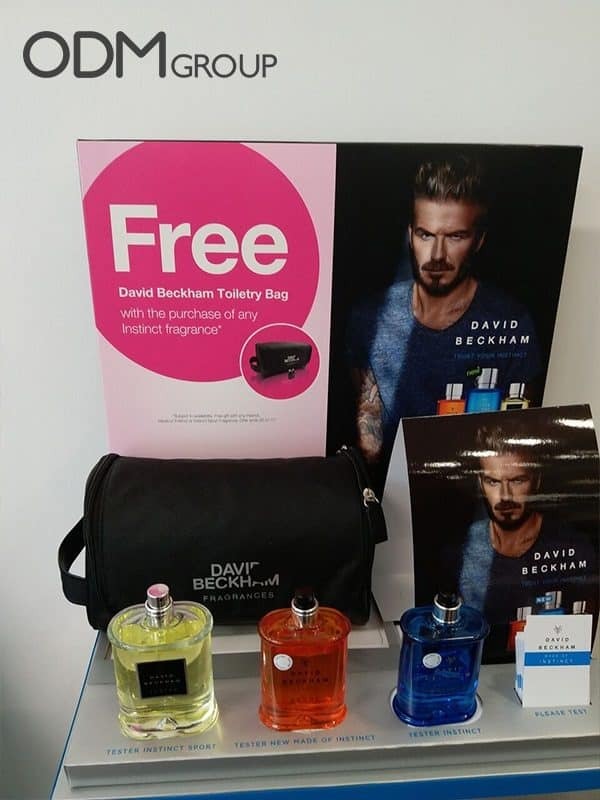 David Beckham Fragrances gave-away a black toiletry bag with a prominent external side pocket. The promotional item was manufactured with PVC lining, 100% polyester, and a canvas-looking material. In Amazon, the product stocks are currently sold out attributing to the fact that on top of purchasing an item from a huge fragrance line, men also get an additional pump for their travel essentials. And you know what, we can also make a promotional custom toiletry bag to boost your sales multiple notches higher. So, why is a toiletry bag a great promotional item? A custom toiletry bag can promote organization. Many people, when they travel, store toiletries in zip-lock plastic bags. And for them, getting a free trendy and cool storage to avoid digging through scattered toiletries is a huge convenience. If your products are displayed in areas where tourists frequently visit or are in shelves with many other toiletries, the delight and convenience of getting a durable free custom toiletry bag can’t be compared to anything. Compartments: The interior organization of a custom toiletry bag is a huge consideration. It is necessary for preventing contents from spilling or shifting while you are in transit. Exterior pouches are also an element that people watch out for because it is the most useful in storing tiny items like lip balms or medicines. Hanging hook: A high-quality hanging hook is another element that buyers look for. While a swiveling hook offers ultimate versatility, those that can accommodate a shower rod, a towel bar, or a doorknob also work. Color and bonus features: The overall look has a lot to do with why people choose them. An ideal custom toiletry bag is one that comes in a wide array of color choices. It also has bonus items like see-through pouches and removable mirrors. ODM can produce promotional custom toiletry bag for your products. Whether you like it lightweight and leak resistant with several internal organizations or just the simple classic design that the US army uses, we can make the custom toiletry bag for you. Call us today! We’d love to hear from you.